Experts from the Russian Ministry of Natural Resources are developing ways to supply fresh water to the Crimea from the Kuban River in the Krasnodar region to the North Crimean Canal which now receives limited water-flow, as Kiev tightens the lid on Simferopol. “As one of options of providing the peninsula with water, we are considering an option of drawing water supply from the Kuban River and channeling it through the Strait of Kerch to the end portion of North Crimean Canal,” director of the department of public policy and regulation in the field of water resources ministry of Russia Dmitry Kirillov told Ria Novosti. He added in order to do so the transfer an underground pipeline has to be built in three segments, with each stretching about 130 kilometers. The options of laying a pipeline through the sea bed of Kerch Strait on special supports or as part of a bridge is now only in the design stage. Transferring water stock from the Kuban River via the Kerch Strait is estimated to cost up to 100 billion rubles ($ 2.8 billion). “The topography allows to run the water in the opposite direction, from the east to north-west, using the cut off North Crimean Canal. Water from Kuban will be enough to meet the needs of housing, utilities, and agriculture of Crimea,” Kirillov explained. Before Crimea joined Russia in March, Ukraine provided up to 85 percent of the peninsula’s water needs, through the canal stretching from the Dnepr River. The Crimean authorities have repeatedly asked Kiev to renegotiate water supply contracts. Instead Ukrainian authorities cut the flow of water from the normal spring level of 80-85 cubic meters per second to 4 cubic meters per second, the lowest technically feasible volume. Kiev justified their action by claiming that Crimea has an outstanding debt on water supplies. Recently released satellite photos seem to confirm earlier reports that Ukraine is purposefully trying to create a drought in Crimea by building a dam. The new sand bag construction is being erected in the Kherson region about 40km from the border with Crimea. 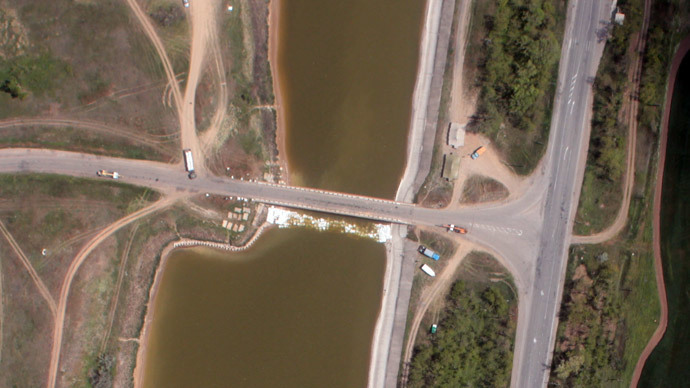 Photos depict cranes operating on the side of the Armyansk - Kherson highway on a bridge in the town of Kalanchak. “With the help of cranes and other construction equipment, the dam in the canal is being built right from the bridge,” one eyewitnesses told Itar-Tass. However the head of Kherson Regional State Administration, Yuriy Odarchenko, claimed that the newly built dam is related to construction of a “water metering station” which “will be finished soon” and will give precise measurement on the “amount of water that will be transferred to the Crimean peninsula,” RBK Ukraine reported. Kiev closed sluices of the North Crimean Canal in April. At the time of the closure, Crimean Prime Minister Sergey Aksyonov called Kiev's move an act of sabotage. “Ukraine’s act of sabotage to limit the supply of water to the republic through the North Crimean Canal is nothing but a deliberate action against Crimeans,” he said, hinting at the possibility of drilling wells to compensate for water shortages on the peninsula, especially for the agricultural sector. “The rice situation … is the worst. Crimea is redrawing the map of crop areas in regions where irrigation may not be available,” he added. Crimean farmers are estimated to lose up to 5 billion rubles ($140 million), according to Russia's Agriculture Ministry. “The harvest will be partially or fully lost across 120,000 hectares of farmland that should be irrigated [by water from the canal],” Agriculture Minister Nikolai Fyodorov said in April, as cited by the Moscow Times. Fyodorov said that Russia is willing to compensate farmers for some of their losses, as he stressed that Kiev refused to accept advance payments for Crimean water.